This pair of Gloves really impressed me. I didn’t know a lot about the brand so I was trying these gloves out with no expectations at all. This Flambeau Heated Gloves review will be as detailed as possible and totally unbiased. These are getting rave reviews all over the internet so I just had to try them out and see what all the fuss is about. Flambeau makes all sorts of outdoor products but mostly in the hunting category. 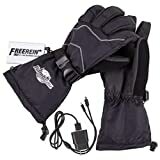 These gloves are good for any type of outdoor winter activity like skiing, snowmobiling, shoveling snow and whatever else you can come up with but Flambeau is specifically targeting hunters with these gloves. Flambeau is known to make good quality products that consumers can count on and these gloves are no different. They definitely score high in the comfort category. They are lined with a soft fleece material which keeps your hands warm and feels nice on the skin as well. The cuff is a good length so you can wear them over top of your jacket sleeve if need be but it’s also not too big just in case you want to tuck it under your sleeve. They have a tension strap around the wrist so that you can adjust them to your desired tension. Each glove is filled with 100g of insulation which is just about right I’d say. Sure you could put more in and get a little extra warmth but then you’d sacrifice dexterity and I don’t think it would be worth it. They scored pretty well in the warmth category as well. They have 2 settings….High and Medium. The medium was a nice warm feeling but when I turned it up to high I could really feel it. I’ve used them in a few different climates and they did well even in extreme cold conditions. I wouldn’t say that they are up there with some of the best but they still work pretty well. As you can see from the picture, the heat is distributed all over the palm and all along the fingers and the thumb. Some heated gloves put the heating elements on the back of the hand because with certain elements you can sometimes feel them when you grab something. Putting them on the back of the hand eliminates that. With the Flambeau heated gloves that isn’t a problem. I’m not sure how they managed it but I couldn’t feel the elements even when I was trying to feel them. This is great because most people actually find that the hand warms up better when the heat is on the palm. I’m giving them a 17/20 in the comfort category and a 17/20 in the warmth category. The exterior of the gloves are made out of a 100% Oxford Nylon with a 100% leather cowhide palm. The Oxford nylon feels really comfortable and high quality but more importantly it’s completely waterproof. As for the cowhide it does pretty well in wet conditions too. It will start to absorb a little water after a while and then feel slightly heavy and soggy but this is only in very wet conditions. Even when this happens your hands stay dry because under the leather is more of the nylon. The only way to avoid this would be to eliminate the cowhide leather and make the entire glove out of nylon. This would not be great because it would have a negative effect on the comfort and grip. I think they’ve done a great job making this a comfortable, versatile and waterproof glove. After looking into the Flambeau brand a little I’ve discovered that they’ve been around for quite some time and they pride themselves on quality and durability. When buying a pair of heated gloves you want to be sure that you’re getting a reputable brand because the cheaper brands will not hold up to heavy use or even everyday life. Fortunately Flambeau is pretty good in this department. Since they’re made for hunting they made sure to add some extra protection in the heavily used areas. On top of that they use very high quality materials like the 100% cowhide leather and the 100% Oxford Nylon that will not only last a long time but probably even get better with age. For this category I’m giving these gloves a 19/20. They come with 2 slim, lightweight 3.7V Lithium-ion rechargeable batteries which should be good for at least 1000 charges. They’re advertised to get 3 hours on high and 4 hours on low but that isn’t exactly what you should expect to get in real life use. In our tests we were only able to get 4.15 hours on the high setting which is actually still very impressive especially considering these are quite a bit more affordable than some of this high end brands. Then I was pleasantly surprised with the results for the low setting because they lasted even longer than advertised. We were able to get 6.15 hours on the lowest setting. Keep in mind that we test on brand new gloves and you can expect the battery life to lesson slightly after some time. They also come with an AC charger with a dual mini-USB cord which makes charging a breeze and they charge fully in about 2 hours. I’ve had the same results as a lot of the reviewers on Amazon in terms of fit. I felt like I could have bought one size smaller as they fit a little on the big side. If you’re between sizes you should probably get one size down because these gloves work best if they’re close to the skin. When taking all of the categories into consideration I have to say that these are a great pair of gloves. They can compete with some of the more expensive pairs easily. I know these are being marketed as a hunting glove and yes they are great for hunting but they’re also really versatile. I’d be more than willing to recommend them for skiing, snowboarding, snowmobiling or any other outdoor winter activity. I think it’s the good dexterity that makes them great for hunting but that’s something that will benefit you for any outdoor activity. They do not have the ability to work with a touchscreen which is s slight negative to them but not a deal breaker in my opinion. Another great thing is that they are machine washable just make sure that you remove the battery first. I received my Flambeau heated gloves as a gift. Probably bad recharge Freerein 3.7 v batteries as I have never gotten the amount of heat that I would expect or any more than 1 hour. No receipt but can I replace / exchange the batteries and if so, what is the process? Every time you recharge the batteries it works 1/2 as long as the previous charge.